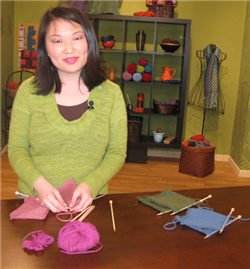 Host of Knitting Daily TV and editor of Interweave Knits magazine Eunny Jang opens this episode with an overview of some fun joining methods. She takes a look at a couple of seaming examples versus projects that use joins such as the three-needle bind-off or the three-needle i-cord bind-off. For more tips like this, visit KnittingDailyTV.com for your free downloadable eBook of 40 Tips & Techniques for Knitters of All Skill Levels. Celebrity crafter Deborah Norville is back and joins Eunny with some cute crocheted stuffies. 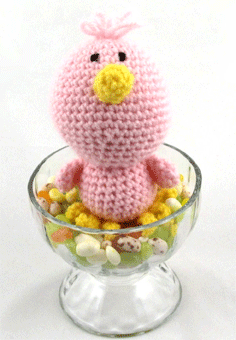 She demonstrates how to crochet the Spring Chickie, a seriously sweet project that makes a great handmade gift. Download your free pattern for the Spring Chickie. 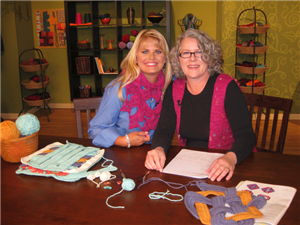 Marcy Smith and Kristin Omdahl are back with another segment on the Chain Reaction Afghan Crochet-Along. This time they discuss two of the afghan squares that have woven design elements. Download all the patterns for the Chain Reaction Afghan Squares on KnittingDailyTV.com. Last up on episode 705, Eunny is back with a quick tip on making jogless joins. Download tips like this with your free eBook of 40 Tips and Techniques for Knitters of All Skill Levels, from designers seen on Knitting Daily TV. Get the entire Series 700 of Knitting Daily TV on a 4-Disc DVD Collection! Click here to purchase DVDs of this season or previous seasons of Knitting Daily TV.